Sydney Adventist Hospital recently opened the 12-story LW Clark Towerm which is home to a new Maternity, Women’s Health and Children’s Unit, an Integrated Cancer Centre and Healing Garden, and provides capacity for up to an extra 200 hospital beds, and 10 extra operating theatres. With its existing facilities combining to provide the Hospital with a total of over 550 inpatients beds, another 300 plus day beds, and up to 24 operating theatres, the Redevelopment reaffirms Sydney Adventist as the largest private, and the largest not for profit, hospital in NSW. 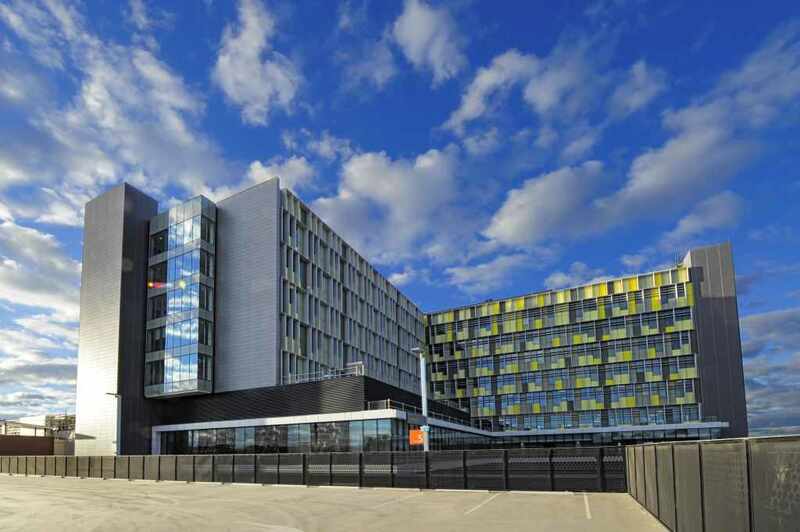 The LW Clark Tower complements the already opened additional 896 space multi-deck car park, stunning new arrivals area and Clinical Education Centre. The Redevelopment took almost 10 years of planning and just over three years to construct and will cater for the over 50% increase in patient demand by the increasing and ageing population for hospital services expected by 2026. In keeping with other buildings and wards already named in honour of significant figures in the San’s 111 year history the tower was named in honour of Chief Executive Officer Dr Leon Clark, who has been a driving force in the San’s growth and its reputation as a centre of excellence. The newly opened new maternity unit includes 56 architecturally designed private rooms with ensuites, partner accommodation, a 9 room birthing unit, 2 birthing pools, and well-baby and special care nurseries and spectacular bushland views to the city. The first baby in the new maternity unit was Georgia Hogan, latest daughter for Melannie and John Hogan and sister to 2 year old Savannah born in the San’s previous unit. The new Integrated Cancer Centre is designed so that stressed and vulnerable cancer patients have quick and easy access to all the x-ray and other screening or imaging, specialists, surgical and medical treatments, recovery and support services they need. The San is the largest employer in the Hornsby Ku-ring-gai region with over 2200 nursing staff, and 800 medical specialists. It cares for more than 230,000 patients a year providing diagnostic, acute care, medical and surgical treatments, cutting edge equipment, rehabilitation, education and research facilities.